On March 3d, Passport Magazine in conjunction with the Moscow Times, sponsored Moscow’s first CEO Night at the exclusive Grand Havana Room business club. 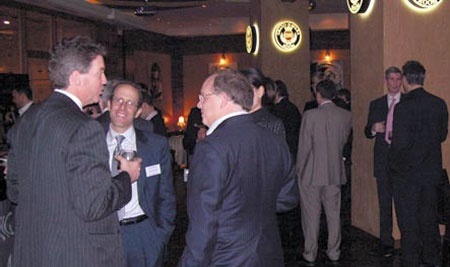 It was organized by Stephen O’Connor (AIG/Lincoln), Tom Keller (Iron Mountain) and Daniel Klein (Passport legal columnist and partner at Hellevig, Klein & Usov). Invitations were strictly limited to local heads of the top 2000 world companies and heads of top 500 Russian companies. Attendees included Russian heads of some of the world’s well-known brands in the banking, media, pharmaceutical and IT industry. Attendees also got a chance to sample some of the finest whisky’s which were supplied by Maxxium liquors. Many of the attendees commented that this was a great event concept since it was a unique forum for top CEO’s to mingle and network. The Grand Havana Room which boasts the world’s largest cigar humidor, was the ideal venue for the event as its members are mostly heads of large companies and high net worth individuals. If you are interested in an invitation for then next event (likely to be held the 2nd week of April) please write daniel.klein@hkupartners.com.